"Halfway to St Patricks Day"
Black 47 espouses an unblinkingly political and thoroughly Irish form of rock 'n' roll, with songs covering topics from the Northern Ireland conflict to civil rights and urban unrest in contemporary New York. Black 47 earned their chops playing the pub scene in Manhattan and self-producing their first indie record, Black 47, before converting The Cars' Ric Ocasek to the cause and gaining mainstream attention with their second album. 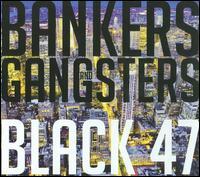 The band celebrates their 20th year on the road with their latest album "Bankers and Gangsters"